A lot of us have the tendency to think that financial planning is something only for high-net-worth individuals or those with complex financial situations or worse those with messy financial situations. However, nothing can be further from the truth. By giving a direction to your financial life, financial planning can not only help you secure your future but also make you more comfortable with what you are spending today. The first step of financial planning is to find out where you stand today with respect to your income, expenses, assets, and any outstanding liabilities. You can think of this exercise as making your personal balance sheet. a. Savings: What are your annual savings and also your accumulated savings relative to your annual income. b. Debt position: How does your debt stand relative to your assets and how do the interest payments stack up against your income. c. Liquidity: What is the composition of your assets, liquid vs. illiquid, financial (typically more liquid) vs real assets. It is always important to evaluate your balance sheet relative to your age (as a proxy for your current stage in life). When you are young, in your 20s and early 30s it is natural to have higher expenses relative to income and low accumulated savings. Also, a significant portion of income is likely going towards servicing a home loan on a house which is a significant percentage of your assets. However, the ratios should improve as you get older. Once you have analyzed your balance sheet, and in case you find that the debt situation is precarious ( if you are spending greater than 40% of your monthly income in debt repayments then that is a good indicator) then that should be your first and foremost area of action. I have often come across one question from investors: if they have a surplus, should they use it to pay off their outstanding debt or make investments. And the answer in 90% of the cases (I will come to the exceptions later) is to pay off debt. The choice really is between the post-tax cost of having debt vs. the post-tax returns that your investments can generate. If you look at almost all the consumer-oriented debt out there such as credit card debt, EMIs on the car, durables etc. then usually the rate of interest charged is so high that no reasonable investment can beat that. So if your debt-income ratio is >40% then you should, first of all, pay off debt to lower this ratio. This could be through cutting down on expenditure and even selling off assets if need be. The only “good loan”, that one can think of is the home loan – the rate of interest is reasonable and both the principal and interest payments are tax deductible which further brings down post-tax cost. A long-term portfolio in equities can likely earn you more than the cost of home debt. Hence that is one debt that can stay in your books. However, even mortgage payments should be no more than 30% of your income. With a clean (low-debt) balance sheet as the starting point, the next area to focus on is insurance. The number 1 ground rule here is that insurance is not an investment. While many insurance-investment products are available (some even marketed as the right investment for specific goals such as child education) usually the returns on these “investments” work out to be quite low. Investors are almost always better-off buying pure protection plans and handling investments separately. At a minimum, you should consider buying the following two kinds of Life insurance and Medical insurance. a. Life insurance: The first thing to know about life insurance is that you only need it if you have dependents. The second thing is that the amount of life insurance you buy should be directly related to the needs of your dependants rather than an arbitrary number. A simple rule of thumb is that the sum insured should be sufficient to pay any outstanding loans that you have plus once it is invested it should be sufficient to provide for any goals that you have and generate a desired regular income scheme for your dependents. b. Medical insurance: This is more straightforward. Many salaried employees already have a health insurance plan provided by their employer. They should go through the terms and conditions carefully especially the sub-limits and apply for an appropriate top-up plan in case required. For those who have to buy medical insurance themselves, they need to choose between family floater plan and individual medical insurance. The premium for a family floater plan is generally determined by the oldest insured member and hence these plans are best suited for young families. For families with senior citizens, it may be better to buy individual policies for the older members and buy a family floater for the younger members. With insurance and debt payments are taken care of, what you have left is your investible surplus. This is the total of your assets (minus debt and minus the house you are living in) plus your surplus savings every month. This is the amount that you can invest to achieve your financial goals. However, before you achieve your financial goals the first step is to define them and define them clearly. For instance, saying “I want to be wealthy” does not help. Instead of something specific and measurable like “ I want to be a millionaire by the time I am 40” is more likely to be achieved. The next step is to then determine an asset allocation for each of your goals. The general rule here is that you can invest in more risky assets like equities for goals which are further away because these assets also have higher expected returns even if there may be ups and downs in any single year. Similarly, for goals which are more near terms, it is better to invest in safer assets such as debt because that you gives you a higher probability of getting positive returns over the period. While goals are personal to an individual, there are two goals which are near universal which you should think about. a. First is Emergency funds. While we have already talked about insurance, but there can also be other unforeseen emergencies for which you need to be prepared. The usually suggested size for an emergency fund is about 3-6months of your monthly income. Further, because the emergency funds can be needed anytime it is a good idea to keep them invested in extremely safe assets which give just about enough returns to beat inflation. b. The second near universal goal is Retirement Planning. The first crucial question here is to determine the retirement corpus that you want to achieve. Like determining the corpus for life insurance, this problem is one of estimating the kind of income that you would like to have during retirement, seeing how that would increase with inflation and then figuring out an amount which when invested in safe assets can generate that income stream. The second crucial question is to determine an asset allocation depending on how far you are from retirement. Do remember to update this asset allocation as you approach retirement to move to safer portfolios. Based on the corpus that you want to reach and returns you expect to generate (given asset allocation) you can determine the amount you need to invest today and/or every month. Many people may be surprised to see tax planning as the last item in this list since saving taxes often get top most priority in our financial lives. However, in reality, you should never invest just to save taxes. Instead, once you have an asset allocation in place ( i.e. you know how much you want to invest in equities, debt gold etc. ), then you should look for tax saving alternatives in these categories. For instance, if we look at the tax deduction available under Section 80C, then there are perfectly good investments available in both the equities (ELSS funds) and debt categories (PPF). Whether you should invest your 80C limit in one or the other and by how much depends on the asset allocation that you arrive at based on your goals. With these 5 simple steps, your financial plan is ready. Just remember that financial planning is not a one-time exercise. You need to revisit your financial plan every time there is a major change in your life such as marriage, the birth of a child etc. Apart from that the second condition for getting your financial plan to work is to stick to it. This may seem obvious but is easier said than done. Make a financial plan, stick to it, keep revisiting it periodically and see your goals turning into reality! Happy Planning. 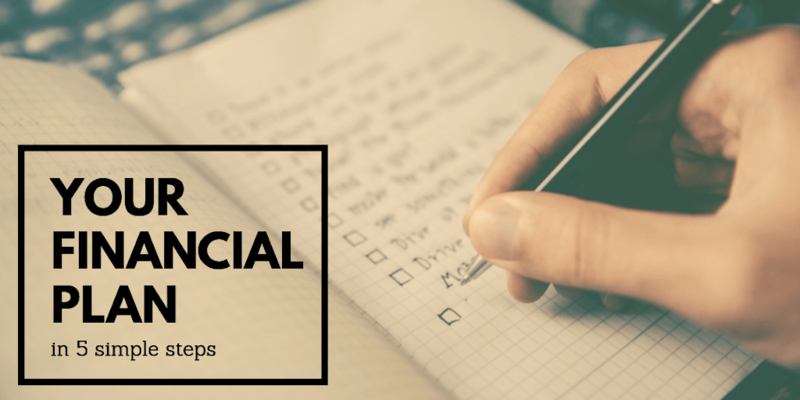 While having a financial plan is a great idea, in our busy lives we often do not have the time to sit down and make a plan ourselves, let alone revisiting it periodically. A financial planner can take away this headache, not only making a plan but making sure that you stick to it. At ORO, we offer comprehensive financial planning services. We are a fee-only advisor and only offer you 0-commission investments so that you can rest assured that we are only working for you and not for commissions. Contact us to know more. This is way too practical. We must apply in real life!! If i hold medical insurance from my company and also i get another insurance from insurance company so at the time of claiming which one should i claim first ?? if i pay 1.5lac in PPF ie. annual limit of PPF,and still i am crossing income tax limit after paying my all insurance and home loan,what is the other way to save my income tax ?? If i dont take any investment plan policy from policy company and only choose term plan and investment all my income into mutual fund and PPF so is it the right decision for me ? Yes. It is usually best to separate insurance from investments. The way to do this is to buy term insurance (which is pure insurance) and invest elsewhere. These investments can be in mutual funds, PPF and other instruments depending on your personal circumstances, goals and risk appetite. You can save an additional 50k in taxes by investing in NPS though that comes with a lock-in and there is still tax on maturity (though not on full amount). Another deduction which may or may not be applicable to you in on interest amount of education loan under section 80C. What according to you should a good insurance plan cover in the categories you suggested? Will GST have any direct or indirect effect on investments? I am a bit confused about your opinion on equity funds. From my understanding they are the highest-risk funds because their performance depends on whether that theme or sector is doing well or not. These funds should never be a part of your long-term portfolio. They require timed entry and exit & serve only to make money for the duration that a theme is favored by the market. Very informative. The 5 step financial plan guide helps in better understanding. Any suggestions regarding investment in direct mutual funds? I wanted to know more about networth distribution. How much should I invest in Long term and short term plans? What are good long term financial habits? I am new to investing. A friend of mine suggested that I start investing in Direct Mutual Funds. What are the advantages of doing so? If i want to invest in short turm mutual funds, that will help me to save the tax ? i was reading your article of 'pay off outstandingdebt now' but my car loan and home loan is 40% of my salary. so please suggest me what should i do to get in the normal mortgage window of 30% payments. Perfect artical, and I have bookmarked it for future and share to others. My parents are senior citizens and deaf and mute. Health insurance companies are not willing to provide any coverage for them. Do you know have any solution for this problem? Don't you think this is a serious issue which needs to be tackled by the government? Thanks for the informative articles. Nice article. Love to read it.